Bring fun and enjoyment to your child's Easter basket. 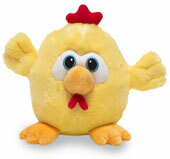 Place our new Little chirping Chick Squeezers along with those other Easter goodies. Give them a squeeze and they chirp and say "Happy Easter". Chicks even have a hang loop to use as ornaments.. They come in assorted colors (our choice please). " Chicks measure 4" and batteries are included. When you need to say it in a special way, give this cute, plush, animated recordable teddy. Give his left foot a squeeze and record your own special 30 second message. Hear it by squeezing his left paw. He moves his mouth and head as he repeats the recorded message. Recordable bear holds a floral bouquet in his right paw. Perfect for Grand Mothers, Mother's Day, Valentine's Day, Birthday's, Feel Better, Breast Cancer Awareness Month, Service men and women serving over seas, friends, or daily messages to a child. Makes a great personalized gift for any occasion or any age. Bear measures 11" and requires 3 AA batteries included. A crazy chicken who reaally loves Easter! Press his foot and watch Clucking Chuck spin around while clucking "Here Comes Peter Cottontail". He's plush and silly enough for that special Easter basket. Chuck measures 8" and requires 3 AAA batteries included. She's all dressed for that Easter parade! Give Flora Bear's hand a press and her head sways and mouth moves as he sings "What A Wonderful World." Flora wears a colorful floral dress and a pink hat. She looks like Spring and you'll feel like it too! Flora measures 19" tall and requires 3 AA batteries included. Not just a plain Easter bunny, but a bunny that recites a 3 minute version of the "Story of Peter Rabbit." Give Story Time Bunny's foot a press and he moves his mouth as he recites, the whimsical story accompanied by delightful music. He stands 12" tall and requires 3 AA batteries included. Keep hoppin' and boppin' along with this animated soft tan bunny. Give his foot a press and he wiggles and shakes his tail wile singing "Who Put the Bop." Wiggles stands 12" and requires 3 AA batteries included. Our cute bear got all dressed up in his bunny suit for Easter. Give his hand a press and his head bobs as he sings out in a cute child's voice the song "Here Comes Peter Cottontail." He's just the perfect pal to include with all of those Easter basket goodies. Boppin' Baxter measures 8" tall and requires 3 AAA batteries included. 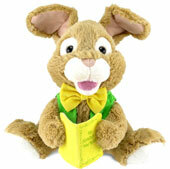 Decorate that next Easter basket with this adorable plush bunny. Bunny Foo Foo is an 11" bunny with an organza bow. Give her a squeeze and her ears move and head sways while singing, "Little Bunny Foo Foo." Kids will like Bunny Foo Foo and you will too! Comes in assorted colors (our choice please). Bunny requires 3 AA batteries included. They're sure to crack you up! Place this pint-size plush cracked egg in that special Easter basket or bag for some fun giggles and smiles. Give the egg a squeeze and laugh along with this contagiously funny egg. Crack Ups come in assorted styles (our choice please). Egg measures 5" tall and batteries are included. Our cute lamb got all dressed up in his bunny suit for Easter. Give his foot a press and his head bobs as he baas out the song "Here Comes Peter Cottontail." He's just the perfect pal to include with all of those Easter basket goodies Easter lamb measures 12" tall and requires 3 AAA batteries included. Try to keep up! When you press this plush bunny's foot, his head bobs and arms move as he sings his own hip hop Easter tune. Fun way to keep 'em all hopping for Easter. Make sure to include him with all of those Easter basket goodies. Hip Hop Bunny measures 11" tall and requires 2 AA batteries included.